← Finally, a Honey Harvest! People often tell me that they are interested in keeping bees and then ask how much equipment and time is needed. Really, the only true answer is, it depends…. Most importantly it depends on what you want to do with the bees. If you want to set up a sustainable microcosm in your own living area and have the bees fertilize your own crops, then you don’t need much. I’ve met farmers who are aware of bees living in trees or abandoned buildings. Here the bees take care of themselves. The farmers benefit from the pollination, and “keep” bees means not chasing the bees away. However most of the people who ask me this question live in a more urban setting. The first thing is to check with local ordinances about keeping bees. 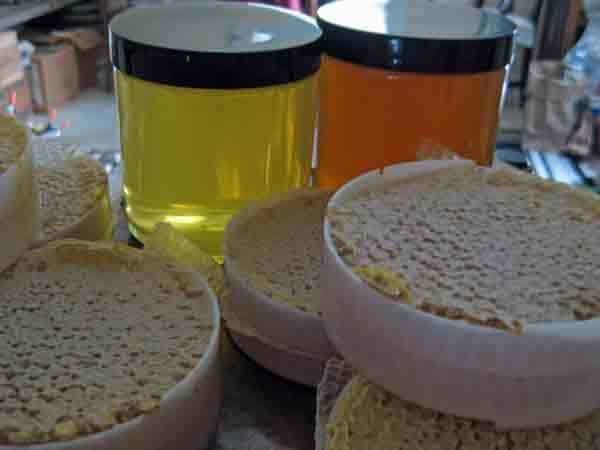 Beyond that all you need is a bee-ginner kit such as from the Brushy Mountain Bee Farm and some bees. The bees can be purchased online and delivered in the mail. Alternatively, bees are often readily available from other beekeepers, especially in the Spring. 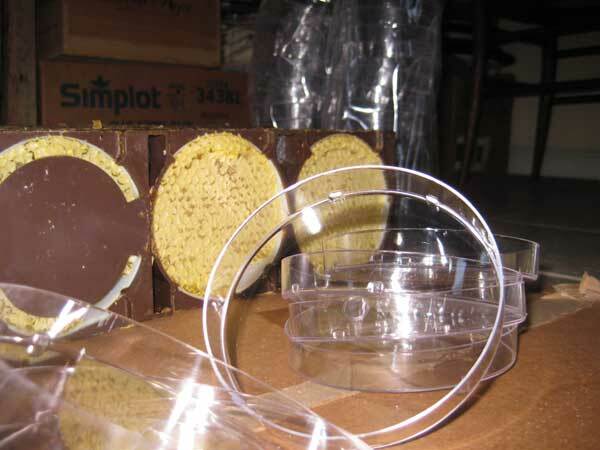 The kit supplies a hive body, bottom, lid, some frames, wax foundation, a smoker, gloves and head protection. Once you start wanting to steal some of the honey, then you need more equipment and more time. Extracting honey or packaging comb especially take time and space – believe me the honey gets everywhere. The ideal is to have a honey house, but if that is not in the budget, schedule time for cleanup. The usual drill is this. 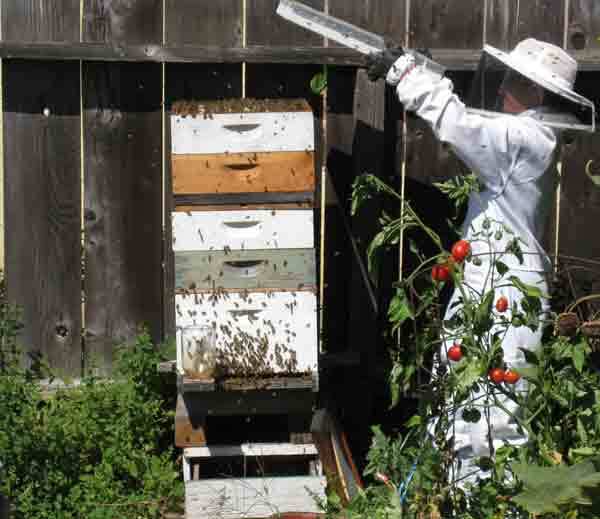 You put your protective gear on and lift the lid to the hive. The frames appear to be full of honey. Using a hive tool, you could lift up one of the frames to check. If you determine that it is time to remove the super, you lift the super to place a bee excluder underneath. Here I am lifting the lid to a tall hive. There are a couple of things to be aware of here. One is that the bees will have secured the super to the lower surface with propolis. The hive tool applies leverage to break this glue, but it often needs to be applied in more than one place. Once you get it free, you need to lift it and set it in a temporary site. 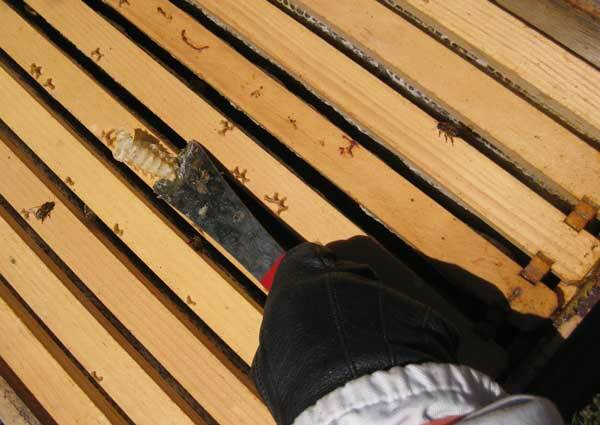 Using a hive tool to scrape off burr comb. A super full of honey and bees weighs between 35 and 50 pounds. Even if you are able to lift this much weight easily in the gym, you must remember than now you are lifting it while you are smothered with bees. Well, smothered is an exaggeration. But there will be a lot of bees, on every surface of the hive and in the air. Basically, you want to move the super slowly and smoothly, and avoid killing any bees. It has happened that I’ve done this stage while there was a heavy flow of pollen going on and the bees have practically ignored me. I have learned to avoid doing this stage while rushed to be somewhere else, or when the day has cooled down, or when the bees just tell me to go away. They do tell me – they buzz louder. Once you catch the attention of the guard bees, more bees attempt to scare or sting you away. Using a smoke helps, but sometimes it’s best to just return another time. Anyway this is stage one. If everything goes smoothly, it takes a half hour. The next day, you return and remove the super. It should be empty of bees or have only a few left and they will fly away on their own after you carry the super away from the hive. Again this can be done in a half hour. Here I am setting a super that is free of bees onto a wagon. Then the fun begins. First you dismantle the super. If you want to extract the honey from the comb, you set the frames aside. They honeycomb should be capped indicating the bees are finished with it. You cut off the top layer of wax with a hot knife and then put the frames into a spinner. Once set into motion (by hand or electricity) centrifugal forces spray honey out of the comb onto the walls of the spinner. The honey then collects on the bottom. Since my partner and I discovered that the application of heat and aeration changes the flavor of the honey (and since we’re working with small amounts), we break the honeycomb by hand and let it drip through a sieve. This ensures the flavor remains as close to the original as possible. Another option is to set up frames with rounds, which the bees fill. (These are usually called Ross rounds). These just need to be capped, sealed and labeled. Then the equipment is ready to be cleaned and set up for the next harvest. This processing can be time consuming and is usually sticky, but the result is sweet! While all that answers the question, it doesn’t really cover three essential elements necessary to keep bees. The real first concern is sunshine. Bees like lots of it. They like warm weather. 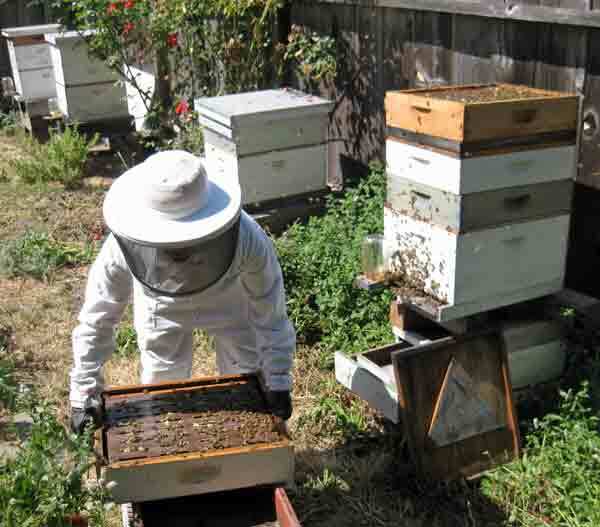 Since I live near San Francisco, people from this city have asked me about keeping bees. My first question for them is whether or not they have a place to set a hive where it will get lots of sunshine. Some do. However, between fog and shade from other buildings, some bee lovers do not have access to a sunny space. Besides sunshine the bees we have also require lots of water. Our hives often have an upside down mayonnaise jar with a perforated lid supplying water. In addition we have a water feature, basically a birdbath filled with stones and water. The stones help prevent the bees from drowning. Bees will go to neighboring ponds, pools and other sources of water to get what they need. This interaction can irritate neighbors. So the most important element of keeping bees in an urban setting is to make friends with your neighbors. Giving gifts of honey can sweeten many dispositions. Obviously bees also need lots of flowering plants and plants in general. In some settings, bees also need protection from other animals that like the taste of honey, like raccoons, bears etc. So the real answer for what is necessary to keep bees is sunshine, water, flowers, and friendly neighbors. Some effort to protect yourself from stings and the bees from predators may also be necessary.